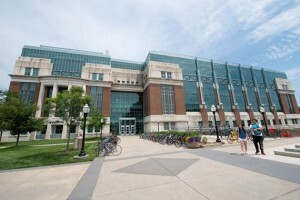 The University of Wisconsin-Madison received more than $1.1 billion in support of research in 2014 (the most recent year for which statistics are available), ranking fourth among all research universities in the United States according to the National Science Foundation. The UW School of Veterinary Medicine (SVM) consistently ranks among the top five schools and colleges of veterinary medicine in research expenditures. The SVM is located near both the main campus and the School of Medicine and Public Health, and faculty at the school hold appointments in numerous departments and training programs across campus. Research at the SVM covers a broad range of topics including strategies to improve milk production and cow comfort, determining causal factors for ruptured cruciate ligaments in dogs, detecting and preventing West Nile virus infection, and restoring respiratory function after spinal cord injury. The SVM truly embodies the concept of “One Health”, and research performed at the school significantly advances both animal and human health.